Didn't know if you read my reply to your comment on my blog, but I was honored you felt my post worthy of reposting on your blog!! I loved the "So today I'm an oncoloblogger about to cite another oncoloblogger who cites another oncoloblogger". 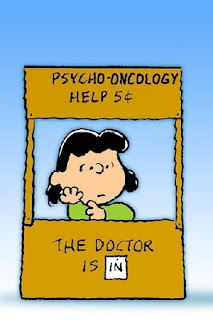 And I am proud to be a newly-named oncoblogger (your TM!). I've since read a bit of your own blog, and am so glad you are going to MD Anderson, my thoughts will be with you on Jan. 8th. Also, just trivia, I spent a day in Sheboygan years ago when I was part of a bicycle tour...rode my bicycle from LaCrosse to Milwaukee and spent a night in Sheboygan along the way. They make the BEST bratworst there!!! I ate 5 that night (after biking 90 miles).